Kelly Ripa, co-host of the weekday morning staple Live with Kelly & Michael, is in hot water with “Bully breed” advocates for a comment that she made on the October 9 episode of her show. The interview continued on air without missing a beat, but Ripa’s condemnation of what is arguably the world’s most misunderstood breed caused a flurry of activity on the web. Pit Bull owners and advocates stormed their Twitter feeds and the “Live with Kelly & Michael” Facebook page to express their disappointment and in some cases disgust with the way that Ripa perpetuated the very negative “dangerous Pit Bull” stereotype, a stereotype that, as we were recently reminded in the case of Irish “Bully breed” dog Lennox, can have devastating consequences. Two petitions have sprung up calling on Ripa to retract her hurtful statement. One petition, courtesy of The Petition Site, has collected over 1,000 signatures, and calls on the host to apologize for stereotyping a dogs with a certain look about them—and insulting Pittie owners in the process. “Not all Pit Bulls are dangerous and most are loving members of families,” it adds. The second petition, circulating on Change.org, urges Ripa to take the time to volunteer at a local Pit Bull rescue so that she can learn, firsthand, about the breed that she so cavalierly dismissed Tuesday morning. 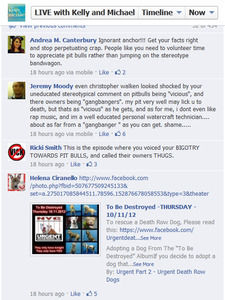 “Abusing your status as a public figure ONLY causes more IGNORANCE concerning Pit Bulls!! !” writes petition creator Kelly Smith. Smith’s petition has already earned over 4,000 signatures, a number that is growing by the day. “I really hope @KellyRipa didn’t say what I think she said this am regarding pit bulls. #Please don’t be true,” Cuoco then tweeted. Actor Wil Wheaton, perhaps best known for his roles on Star Trek: The Next Generation and Cuoco’s sitcom, The Big Bang Theory, also responded to Ripa’s comments via his Twitter page. “Millions of people listen to @KellyRipa. When she spreads misinformation about Pit Bulls, it makes it less likely people will adopt them,” Wheaton tweeted.